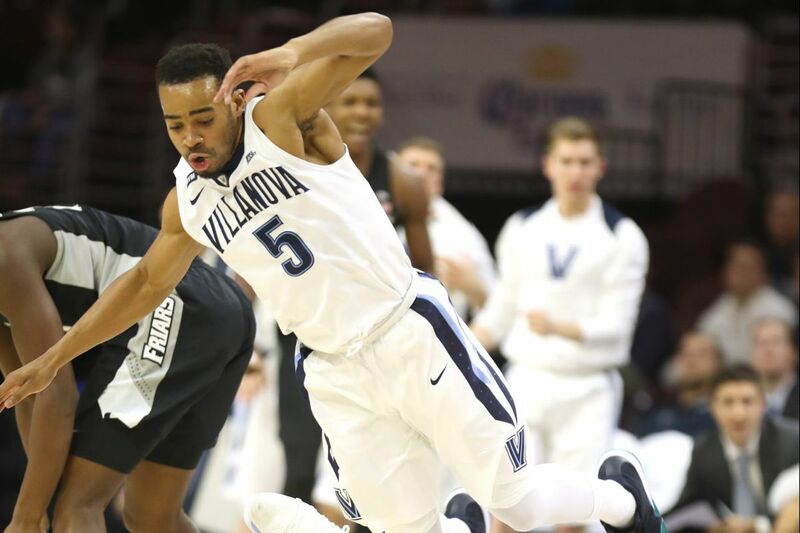 Phil Booth will return to the starting lineup for Villanova on Wednesday night. Villanova is 3-3 in its last six games. The momentum generated by the Wildcats in the first 23 games of the season has diminished. With only two games remaining before the start of postseason play, they still appear to have much work to do to be considered a national championship contender. Jay Wright doesn't want to look that far ahead. In fact, he doesn't want to look past Wednesday night when the fourth-ranked Cats take on Seton Hall at the Prudential Center in Newark, N.J. But he does recognize that time is running short on the 2017-18 season. "We've got a unique situation here where we've got everybody back together but we're kind of running out of time," the Villanova coach said Tuesday after practice at the Davis Center. "So how quick can we really pull this thing together to be a high-level team?" The Wildcats welcomed back Phil Booth last week after he missed seven games with a broken bone in his right (shooting) hand. That marked the first time the entire team was healthy since early December. Wright said the key now is "to get our chemistry together" in a short period. "We've got to think a little bit like we're in the beginning of the season," he said. "We need practice time and we can get a lot better. But we've got to speed up the process and not be frustrated if we don't look so good at Creighton. We're trying to get this thing back together and I think we can do it." As a result, practices will be longer to help the team's four freshmen, including two — Collin Gillespie and Jermaine Samuels — who missed extended time with injuries. Wright also said decisions on rotations and playing time will not be "really based on merit." "Sometimes early in the year, you can let them play and see who kind of plays their way into a situation," he said. "Now you've just got to make the decision and go with it, even though you know it might not be the right one." The Wildcats (25-4, 12-4) lost, 89-83, in overtime Saturday at Creighton to drop one game behind first-place Xavier in the Big East, threatening 'Nova's streak of four consecutive regular-season titles in the conference. Booth, who will return to the starting lineup Wednesday night, said the team is not thinking about losing or generating momentum, but on improving every day. "That's what we focus on," he said, "and the rest will take care of itself — coming into practice every day with a good mind-set knowing we've got a lot to get better at and knowing every team is giving us their best shot. We've had some tough games and we've really got to prepare." Another tough game awaits. Seton Hall (20-9, 9-7) has won three straight, the last two being road games at Providence and St. John's. University officials have opened up the upper deck, which is usually curtained off, for Wednesday night and a crowd of around 17,000 is expected. The Wildcats close the regular season Saturday against Georgetown at the Wells Fargo Center, then head to New York next week for the Big East tournament, before receiving their matchup and destination for the NCAA tournament.